Cohousing design allows sharing of guest bedrooms, laundry, etc. Kingfish House will be an urban infill Cohousing community centrally located in the Temescal District of Oakland, at the intersection of three major arterials. Located on a complex polygonal lot, the design of Kingfish House requires all of the tools at an infill designer’s disposal, i.e. height at the maximum for wood frame (maybe more with the help of a code consultant), no-build and access easements to allow openings and access from adjacent properties, cooperative and knowledgeable planning staff at the city, and a strong constituency in support of the project. The latter, in the form of a fully constituted Cohousing group that was actively engaged in the community, was essential as the project progressed through the approval process in an aroused NIMBY territory. 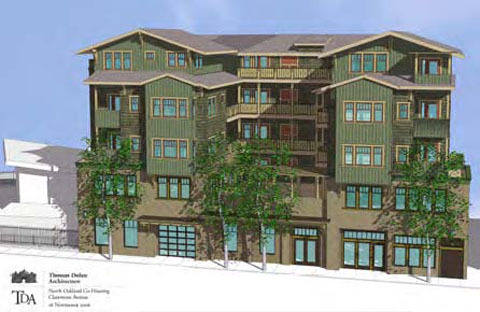 In taking on this project, TDA has been mindful of its obligation to design mixed-use infill housing that is : 1) good for the region by helping Oakland to provide its fair share of higher density housing in transit-oriented locations; 2) sensitive to its context : the building is designed as a craftsman adaptation, taking its cue from larger craftsman houses, apartments and commercial buildings; and 3) a real asset to the neighborhood through the accommodation of a Cohousing group that will contribute to and participate in the community as a community.TDA was chosen to design Kingfish House based on their prior experience designing projects whose common spaces successfully facilitate interaction and strengthen a sense of community. As a Cohousing community with dedicated common dining, living and working spaces at the podium level, the courtyards onto which these spaces open will create a continuum of interaction as residents spill out onto them after meals, or perhaps take their common dinner alfresco. Along the Telegraph Avenue facade of Kingfish House are two commercial spaces that will accommodate walk-in trade or employees, serving two or more of the Cohousing community’s residents and saving them a commute. This is an arrangement TDA refers to as Live-Nearby™.